Magnificent debut release from a 60's influenced indie-pop affair from Glasgow, Scotland. 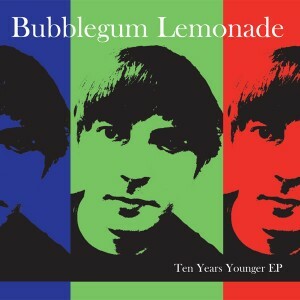 Bubblegum Lemonade is principally a man called Laz, a 12-string Rickenbacker enthusiast with more than a few Velvet Underground, Byrds, Jesus and Mary Chain, and Razorcuts records in his collection. Title track ‘Ten Years Younger’ updates the Mary Chain’s take on The Velvets with nice bursts of electronica and beautiful female backing vocals courtesy of Sandra from fellow Glaswegians Strawberry Whiplash. ‘The Tomorrow People’ is a wonderful 60’s-drenched jangle pop gem that should please even the most ardent Byrds or Razorcuts fan, while ‘Unsafe at Any Speed’ is Ralph Nader meets the Mary Chain with liberal dollops of reverb and distortion. Finally, ‘That Thing You Do!’ is a glorious cover of the title song from the mid-90’s hit movie of the same name. Written by Adam Schlesinger (Ivy, Fountains of Wayne), the song was originally credited to the fictitious band The Wonders and needed to be roughed up a bit as it is here. A fantastic closer to an impressive debut EP. With insanely catchy songs, masterful 12-string guitars, shimmering pop melodies, and the feedback drenched sounds of the Mary Chain, Bubblegum Lemonade is an extraordinary addition to the Matinée roster proving that old school indie will never go out of style. Limited to 1000 copies in custom minijacket sleeve. Cue dodgy dancing, miniskirts and discos down at the old school hall as Glasgow’s Bubblegum Lemonade saunter onto the stage sounding like they have popped straight out of the 60s. Opener ‘Ten Years Younger’, uses futuristic keyboards and dreamy harmonies to bind you under the Bubblegum Lemonade spell whilst ‘That Thing You Do!’ – a cover of a song featured in the mid-90s film of the same name, is gorgeously static and filled with reverb. With their jangly two part guitar melodies and bowl haircuts you can’t help but to bob along to these four lovely, sing-along offerings – covered in a Jesus And Mary Chain haze of fuzzy guitars and echoing vocals. --Is This Music? A cidade de Glasgow é a nossa primeira parada. Terra natal do Bubblegum Lemonade, banda de um homem só, o senhor Lawrence McLuskey, mais conhecido como Laz. Descobri a banda visitando o site da gravadora americana Matinée, e quando ouvi o Bubblegum Lemonade achei que fazia parte do trabalho de relançamentos da gravadora, que compilou várias gemas perdidas do indiepop anos 80 de bandas como Razorcuts e Brighter. Imaginei isso por causa de canções como "Just Like You", que nos levam de volta para 1986, soando como os melhores compactos de bandas como Talulah Gosh, Groove Farm e Pastels. Mas para a minha surpresa descobri que a banda é nova! O nome foi inspirado no álbum solo de Cass Eliot, uma das integrantes do The Mammas and The Papas. Dois eps foram lançados através da gravadora Matinée, o primeiro "Ten Years Yung" saiu no início do ano, e o segundo "Susan's In The Sky" acabou de sair. Provavelmente logo mais deve sair um álbum. Além disso Laz toca também na Strawberry Whiplash (que vai também vai aparecer no Biff Bang Pop!) executando todos os instrumentos, enquanto sua amiga Sandra canta. A influência dos conterrâneos do Jesus and Mary Chain é sentida imediatamente em faixas como "Ten Years Young" e "Unsafe At Any Speed", adicionando elementos ensolarados no espírito do álbum "Psychocandy", encobrindo os traços soturnos dos irmãos Reid. Aqui as canções transbordam energia melódica por meio da voz e da Rickenbacker de doze cordas de Laz. Não espere ouvir guitarras apitando microfonia e ruídos, e sim o resgate da classe de 86 fazendo enlaces com o pop dos anos 60. Preste atenção na byrdiana faixa "Tomorrow People" e verifique o teor sessentista da composição. --Biff Bang Pop!